Would you run for Bourbon? Today I hiked on the Abrams Falls Trail in the Smokies. I usually avoid this trail like the plague, as it gets an estimated 1000 visitors per day during peak season. It's been 5 years since I hiked it, and while I wasn't particularly interested in the falls, there are some good loop hikes in the area. My plan was to hike 4+ miles, ford the river, and come back via Rabbit Creek Trail for a total of 11.2.. Fording the river was doubtful from the beginning, but I was hopeful it would be okay and worked on my courage the whole way there. As soon as I saw it, I knew it wasn't going to happen but it took a while to accept. I sat there and kept saying, "You know LS would walk across this damn river, just do it." (I don't mean that in a snarky way, his fearlessness is an inspiration.) Angry with myself for not even trying, I ate my lunch and continued on down the trail for a mile or so. This is the area that was hit hard by the tornado in 2011. The closer I got to the Abrams Creek ranger station and campground area, the more dramatic the damage. I was amazed at the destruction and can't imagine the work it took to clear the trail. It looked like Armageddon. If it weren't for the sound of the river in the background, the area would have been eerie and unsettling. Even though the loop didn't work out, it was a great 10 mile hike. I'll post pictures of the river and tornado damage in my gallery. cool, look forward to the pictures, gotta be nice to live near such a pristine place...gotta get to the Smokies one day. Never mind the "Like " Button, we need a jealous button! It would have been nice to spend more time, and do more miles, but life is busy and we needed to get home. Kathy took some photos and I'll post them when I get them. uh ...yep! here is hammocking done right! 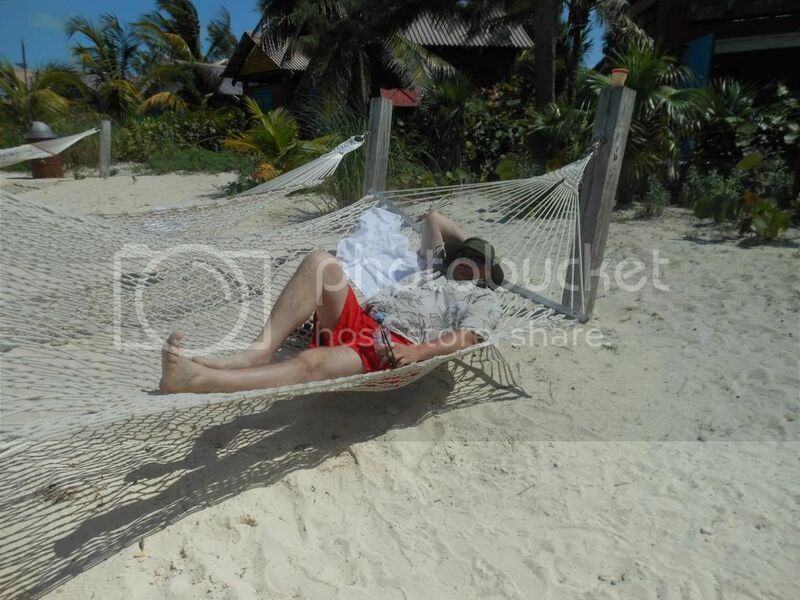 It's that a cotton hammock? What no cuben fiber? Yeah, and the white sand and blue ocean sure beat the snow and ice we had here last week! looks like a Corona commercial!! I took a walk today and found a new place to walk and stay out of the rain- parking decks. It works great, go up for 6 levels at a slight incline, then down the steps 2 at a time, turn around go up 2 at a time, then walk down the deck. Turn around and do it all over again. It was a nice lunch time work out. i did an easy (no pack) 5 miler today. beautiful 65 degrees. can't believe there is a freeze warning for tomorrow. That's a great idea JJ. I ran yesterday and lifted weights today. My schedule (and the weather) isn't looking good for hiking this week, probably not next week either. A little bummed about that. Headed out for a 9 miler today. It ain't much but it's something. Take care of those knees. Build them up, but do not over do it. Saw quite a few of these today which is unusually because they're getting kinda rare. Tastes like spoonbill. That's why they're getting rare. Last night after I'd settled in on the couch to watch some TV, my wife Kathy says Come on, lets take a walk. As we go out the door she says she's got a plan. So we walk about a 1/2 mile to a particular intersection and then she tells me from now on we're gonna alternate between making the first left and then the first right. When she told me that would take us home I said No Way because we'll be walking north and east. We followed her plan and in a few miles where one block away from where we live. I was surprised but she reminded me that not all the streets were straight. When asked if she had figured this all out before hand she said no, it just kind of worked out that way when she had done it by herself on a different day. So, I got in a few miles of walking at night and didn't even get run over by all the traffic on the roads early last night. Not great fun but it did get me up and moving. And in case you don't play corn hole up north, I'm talking about the beer garden game! You grow beer in your garden? I only grow squash, tomatoes, cucumbers, and asparagus in mine. I must be doing it all wrong again. No, we don't play corn hole here in NY, although I do know what it is as I used to work for a company that was headquartered in Kentucky. They were constantly having corn hole tournaments. I got a good laugh when I reread my post. It was just all wrong. I took a walk today from Big Meadows Wayside in the SNP. It was a 5 mile out & back for a total of 10. I wanted to field test some gear. I had made a Parcho from a Quest Outfitters kit that I had never worn in the rain because I was using my Gatewood Cape as both rain gear and shelter. The Parcho worked great, it's very similar to what Cedar Tree sells. I also wanted to test out the shaped cuben tarp in the rain that I had made over the winter. It also worked great. And I wanted to field test BirdBrains stove and some dehydrated veggies and chicken flavored TVP. It was all good. I was hoping you'd post about your walk today, JJ. Do you have a pic of the tarp set-up? I didn't take any pictures of the outside of it today because I didn't want to get my camera wet. The last one is from inside. Here's a picture of it set up in the yard.